The Philadelphia Sports Hall of Fame is a nonprofit organization in Philadelphia, Pennsylvania, U.S., that was established in May 2002, to honor individuals and groups who are either area natives who became prominent in the field of sports or who became prominent in the field of sports in the region. From 2004 to 2010, the organization also presented an annual "Pride of Philadelphia Award" to a team or individual. Individuals, Teams, Venues, Events, and Organizations are all eligible. Generally they must have gained national prominence as individuals or venues while attached to the Philadelphia region, or won a championship as a team from the Philadelphia region. 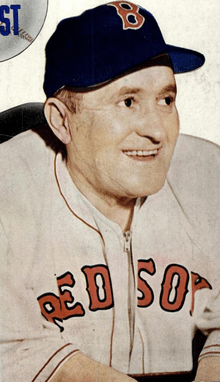 Individuals are eligible for induction five years after retirement from a playing career. When an individual dies, he or she becomes immediately eligible. An individual who was not an athlete may be inducted in the following categories: Legacy of Excellence, Lifetime Commitment, Philadelphia Medal. 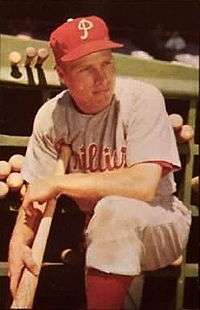 Richie Ashburn, inducted in 2004, longtime player and radio broadcaster for the Philadelphia Phillies. 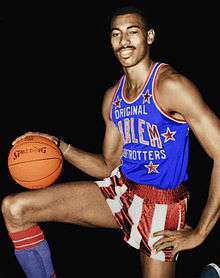 Wilt Chamberlain, an inaugural class inductee, was born and raised in Philadelphia and played for the Warriors and 76ers. 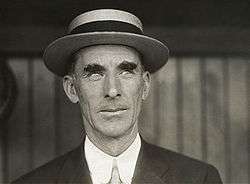 Tennis champion Bill Tilden, inducted in 2004, was born and raised in the Philadelphia area. Harry Kalas, longtime Phillies broadcaster, was the 2004 Legacy of Excellence inductee. 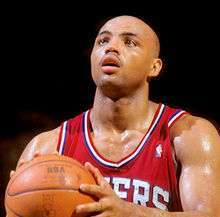 Charles Barkley, inducted in 2005, played for the Philadelphia 76ers from 1984–1992. 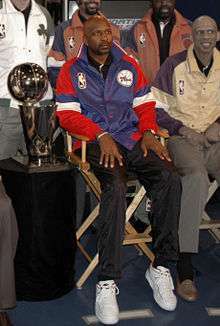 Reggie Jackson, a 2006 inductee, was born and raised in the Philadelphia area. 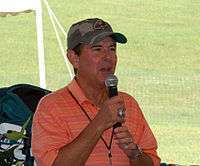 Merrill Reese, inducted in 2009, long time radio broadcaster for the Philadelphia Eagles. 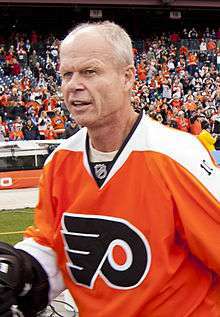 Mark Howe, inducted in 2011, played for the Philadelphia Flyers. 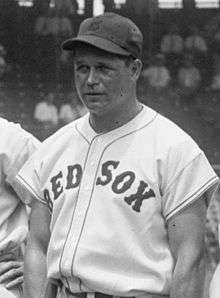 Joe McCarthy, inducted in 2011, born and raised in the Philadelphia area. Moses Malone, played for the 76ers. 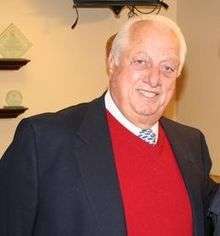 Tommy Lasorda, born and raised in Philadelphia area. 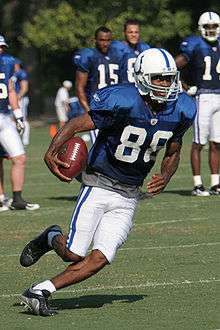 Marvin Harrison, born and raised in Philadelphia area. Inducted The year the person was inducted into the Hall. Sport The sport the person was inducted in. Organization The organization(s) that connect the person to the Philadelphia area. Smarty Jones, a 2004 awardee. 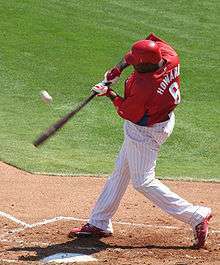 Ryan Howard, a 2006 awardee. 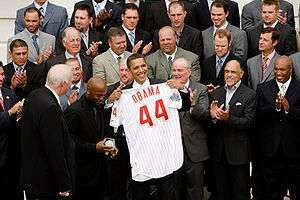 The 2008 Phillies with President Barack Obama at the White House. The Pride of Philadelphia Award is given to teams or individuals who have "represented the Philadelphia area with dignity, determination, and class through athletic achievement." The hall of fame's website has a page that honors every Greater Philadelphia team—college and professional—that won the championship in its particular sport. The Foundation formed Hall of Fame Charities in 2004. It supports or has formed partnerships with organizations in the Greater Philadelphia area that promote youth sports, especially at the pre-teen, grade-school level. These organizations include: Richie Ashburn Baseball Foundation, Police Athletic League (PAL) Junior Golf, Arthur Ashe Youth Tennis and Education, Bruce Simon Southampton Summer Basketball Camp, The First Tee of Philadelphia, and Ed Snider Youth Hockey Foundation. Hall of Fame Charities also has student and community programs. ↑ "Mission". The Philadelphia Sports Hall of Fame Foundation. Retrieved 2011-11-04. ↑ "Our History". The Philadelphia Sports Hall of Fame Foundation. Retrieved 2011-11-04. 1 2 "PRIDE OF PHILADELPHIA". The Philadelphia Sports Hall of Fame Foundation. Retrieved August 1, 2009. ↑ "NOMINATION & ELECTION". Philadelphia Sports Hall of Fame. Retrieved December 26, 2009. ↑ "INDUCTEES". Philadelphia Sports Hall of Fame. Retrieved December 26, 2009. ↑ Zeltman, William (November 13, 2010). "Philadelphia Sports Hall of Fame 2010 Induction". Bleacher Report, Inc. Retrieved 2010-11-22. ↑ At the following webpage, click on the link to a particular sport. "Roll Call of Champions". The Philadelphia Sports Hall of Fame Foundation. Retrieved 2011-11-04. ↑ "Youth Sports". The Philadelphia Sports Hall of Fame Foundation. Retrieved 2011-11-04. ↑ "Student Programs". The Philadelphia Sports Hall of Fame Foundation. Retrieved 2011-11-04. ↑ "Community Programs". The Philadelphia Sports Hall of Fame Foundation. Retrieved 2011-11-04.